Ten years ago, a pregnant seventeen-year-old, Angela Joy Palladino, fled her hometown, Scotia, West Virginia, as a pariah. Over time, AJ succeeded in establishing herself as an environmental activist, dubbed 'The People's Champion,' only to be forced to retreat from the spotlight in the wake of a crushing media disaster. When AJ is offered a job with a lawyer who is crusading against mountaintop removal mining, she is torn. As a single mother of a special-needs nine-year-old boy, AJ can use any work she can get. But doing so will mean returning to the West Virginia hometown she left in disgrace so long ago. Upon arriving in Scotia, AJ learns of the sudden death of the lawyer who hired her. Soon after joining forces with his daughter, Elizabeth, threats begin to surface, bodies begin to pile up, and AJ discovers that her own secrets aren't the only ones her mountain hometown has kept buried. Hitting rock bottom, AJ must face the betrayal of those once closest to her and confront the harrowing past she thought she had left behind. 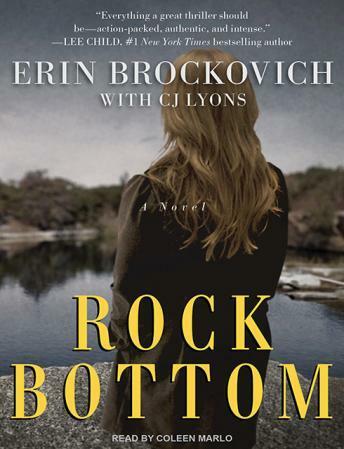 In Rock Bottom, Erin Brockovich combines passionate intensity, first-rate storytelling, and her real-life experiences in a novel that will leave you breathless. I really enjoyed both the book and the narrator. The story was good and kept moving along and the narrator did an excellent job especially with some of the different accents.